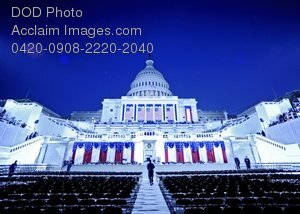 Description: Free, public domain image: U.S. Capitol Building. Final preparations are made prior to President-elect Barack Obama’s swearing-in ceremony on the U.S. Capitol steps in Washington, D.C., on Jan. 20, 2009. More than 5,000 men and women in uniform are providing military ceremonial support to the presidential inauguration, a tradition dating back to George Washington's 1789 inauguration. DoD photo by Master Sgt. Cecilio Ricardo, U.S. Air Force. (Released.